Keller, Timothy. 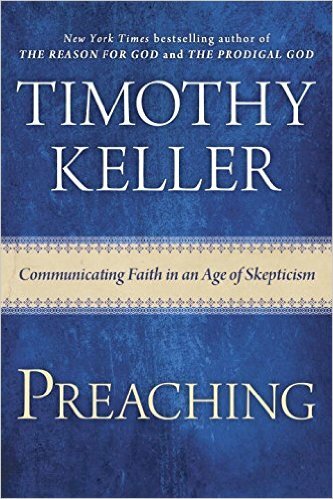 Preaching: Communicating Faith in an Age of Skepticism. New York: Viking, 2015. Preaching is not a book that gives detailed steps on how to construct a good sermon (though it does include an appendix on "Writing an Expository Message"). What the book does do is tell us what a good preaching should include (e.g., preaching Christ from all of Scripture). Sound preaching arises out of two loves--love of the Word of God and love of people--and from them both a desire to show people God's glorious grace (p. 14). To show how a text fits into its whole canonical context, then, is to show how it points to Christ and gospel salvation, the big idea of the whole Bible (p. 48). It is crucial in our preaching that we do not simply tell people all the ways they must be moral and good without relating such exhortation to the gospel. Nor should we simply tell them over and over that they can be saved only be free grace without showing how salvation changes our lives (p. 51). [Contextualization] means to resonate with yet defy the culture around you (p. 99). Let's lay out six sound practices for preaching to and reaching a culture. Use accessible or well-explained vocabulary. Employ respected authorities to strengthen your theses. Demonstrate an understanding of doubts and objections. Affirm in order to challenge baseline cultural narratives. Make gospel offers that push on the culture's pressure points. Call for gospel motivation (p. 103). Unless the truth is not only clear but also real to listeners, then people will still fail to obey it. Preaching cannot simply be accurate and sound. It must capture the listeners' interest and imaginations; it must be compelling and penetrate to their hearts (p. 157). If you want to preach to the heart, you need to preach from the heart (p. 166). 1. Discern the goal of the text by itemizing all the things that it says and looking for the main idea that all the other ideas support. 2.Choose a main theme for the sermon that presents the central idea of the text and ministers to your specific listeners. 3. Develop an outline around the sermon theme that fits the passage, with each point raising insights from the text itself, and has movement toward a climax. 4. Flesh out each point with arguments, illustrations, examples, images, other supportive Bible texts, and, most important, practical application (p. 214). I'd give this book a 4.5 of of 5. 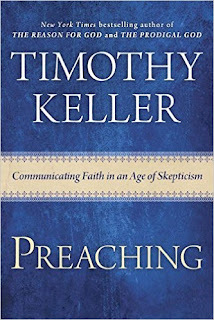 I usually enjoy Keller's writing, and I think in this book would benefit any preacher. Helm, David. Expositional Preaching. Wheaton, IL: Crossway, 2014. 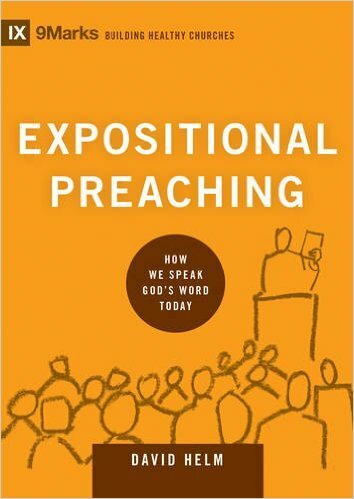 Expositional Preaching is a small book (only 128 pages) but contains a generous portion of pratical advice for preachers. Below are a few of my favourite quotes from the book. ...contextualization in preaching is communicating the gospel message in ways that are understandable or appropriate to the listener's cultural context. In other words, contextualization is concerned with us and now. it is committed to relevance and application for today... (p. 16). ...the preacher is bound to miss the mark of biblical exposition when he allows the context he is trying to win for Christ control the Word he speaks of Christ (p. 17). Exegesis is not enough. Done in isolation, exegesis alone can lead to preaching that is either overly intellectual or merely imperatival (p. 57). While a healthy gospel ministry is always textually drive, it must be contextually informed (v. 87). ...the people are the point! (p. 89). ...those whom Jesus sets apart to proclaim the gospel are those who demonstrate their love for him by loving his church! (p. 90). Preachers cannot be too simple. We need clarity (p. 98). Articulate the Author's Aim (p. 99). When it comes to application, the first thing to be said is that biblical expositors aim for a change of heart. We are not merely looking to apply God's truths to the minds of our listeners, as important as that work is (p. 102). I'd give this book a 3 out of 5. 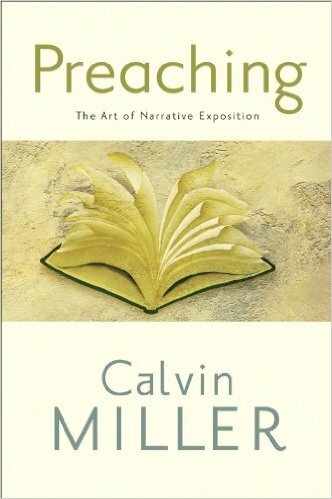 It's not a top 10 book on preaching, in my opinion, but it's contains some helpful nuggets...and it's a quick read. Then Satan answered the LORD and said, “Does Job fear God for no reason? … But stretch out your hand and touch all that he has, and he will curse you to your face” (Job 1:9-11). Loving God for Just the Benefits? God said to Satan , “Have you considered my servant Job, that there is none like him on the earth, a blameless and upright man, who fears God and turns away from evil?” (1:8). Satan wasn’t impressed. He replied, “Does Job fear God for no reason?” (1:9). Satan believed that Job loved God because God had blessed him. So he said to God, “[Take away] all that he has, and he will curse you to your face” (1:11). When life falls apart, how is it possible to love God? Even when life falls apart, we can love God because we have proof that he loves us. For Job, life was good. He was “the greatest of all the people of the east” (1:3). But there came a day when everything changed. On that awful day, Job was given one piece of devastating news after another: the Sabeans stole his oxen and donkeys (vv. 14-15); fire from heaven killed his sheep (v. 16); the Chaldeans stole his camels (v. 17); and, worst of all, a storm killed his children (vv. 18-19). Job didn’t understand why his life had fallen apart. He wasn’t reaping what he had sowed. He was “blameless and upright, one who feared God and turned away from evil” (1:1). He was an innocent sufferer. Why Is There Innocent Suffering? Job believed that God is sovereign and could have prevented his suffering. In his grief, he declared, “The LORD gave, and the LORD has taken away; blessed be the name of the LORD” (1:21). 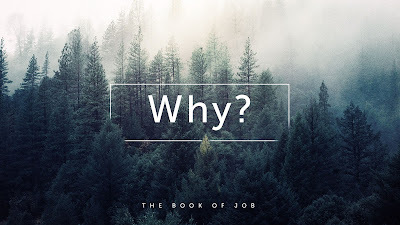 If God is all-loving and all-powerful, why did Job suffer? The book of Job doesn’t give us the answer to this question. How can God expect us to love him if he doesn't give us the answer? Who was this man? It was Jesus. Jesus is the ultimate Job. He is the ultimate innocent sufferer. When our “Why?” questions go unanswered, we should remember what God said to us through the cross. Through the cross, God says, "I love you." Let’s not forget who Jesus is. Jesus is God in human flesh. (God is three-in-one: Father, Son, and Holy Spirit.) God “knows what suffering is all about, not merely in the way that God knows everything, but by experience.”  God chose to become an innocent sufferer. And why did he choose to suffer? He chose to suffer so that one day our suffering would come to an end. When Satan tempted Adam and Eve to disobey God, his strategy was to get them to doubt God’s love for them: “God doesn’t really love you?” Satan tried the same strategy on God: “Does Job really love you?” God, without wavering, answered, “Yes, he does.” What an honour it would be for God to say the same thing about us! The cross should convince us that God loves us. If we’re not convinced that God loves us, we’ll probably turn from him when suffering comes into our lives. There’s lots of speculation about why and how this conversation between God and Satan took place, but this sermon will focus on the conversation itself. “He was despised and rejected by men; a man of sorrows, and acquainted with grief” (Isa. 53:3). “My God, my God, why have you forsaken me?” (Matt. 27:46). D. A. Carson, How Long, O Lord? Reflections on Suffering and Evil, 159.